UK, 1969, 99 minutes, Colour. Phyllis Diller, Milo O' Shea, Billie Whitelaw, Sydney Chaplin, Julian Glover. The Adding Machine was a social-minded play written by Elmer Rice, author of Street Scene in the '20s. His friend Jerome Epstein worked for some years preparing the screenplay for this film. However, the adaptation of such an allegorical social play to the screen is very difficult and probably does not come off very well. Most audiences would find it difficult in both content and style. However, if an audience is prepared to work with it it is interesting and rewarding in its social fantasy. The cast is generally British and very effective especially Billie Whitelaw. Irish Milo O' Shea is very good in the central role but the surprising casting is Phyllis Diller who blends comedy with a serious performance. Interesting cinema experimentation and a version of a prominent American play. 1. Audience response to this film, its lack of popularity, lack of cinema release? Its impact and themes? 2. Was it evident that the film was based on a play? A play of the '20s, adapted to the '30s? The transition of thews throughout the decades of the 20th. century? Its impact in its own time, at the time of its release, now? Is this kind of thematic treatment relevant or not? It was avant garde at the time, How does it appear now? The strength of the dialogue, the strength of particular sequences? 3. The fact that the film was made in Britain, the use of English settings and colour etc.? Made for an American audience? 4. The title and its focus on the machine? Its reference to the character of Zero? Was he an adding machine? What had made him one? 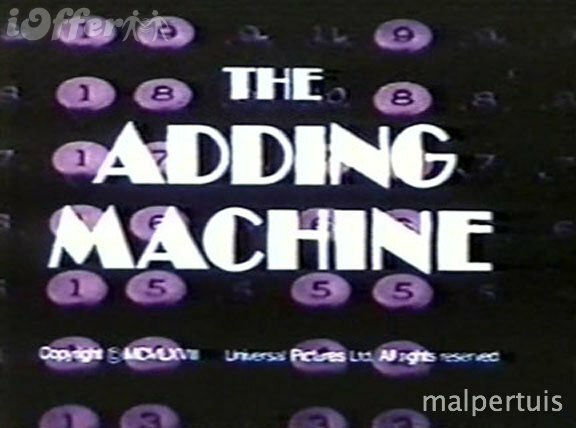 The various adding machines portrayed in the film? Its role on earth, the role of the adding machine even in Heaven? What point was being made about mechanisation, robots, human beings becoming robots, becoming characterless Zeroes? 5. How strong was the character of Zero? Should he have been a strong character? The characterless adding machine, the henpecked husband? Was he a picture of pathos or of non-response? The sequences in the house, Mrs. Zero's complaints and their effects on him? The interaction of the two characters and the meaning of their life? The glimpses of the Zeroes? What outlets did he seek? For relief? 7. The contrast of the work sequences? Was this a different Zero? Did he have any more character and autonomy at work? Did he become an ordinary man or was he still a cipher? His reaction to Daisy at work? Her influence on him? 8. The importance of the monologues. The meaning of the film coming through these monologues? The change of colour to highlight this? 9. The significance of the sacking, its suddenness, its effect on Zero, the unexpected violence and murder? 10. Was the violent response to the sacking explained by Mrs. Zero's nagging, the long sequence of the card game, its personalities, significance, the fights between husband and wife, the forms kept up for the edification of visitors, the violence and the laughter? Zero's not being able to cope with this? 11. The arrest coming suddenly within this framework? The effect on everyone? Zero's willingness to go? 12. How impressive were the trial sequences? The ritual presentation, the symbolic waning? The impassioned speeches? Why did Zero come alive at the trial? 13. The effect of prison on him? His encounter with Shrdlu? The importance of the build up to their deaths? 14. What kind of Heaven was presented? The cheap arcade and the hellishness of this? The satire on expectations of Heaven and not being satisfied with these? 15. The character of Shrdlu and his importance, his murder of his mother, his religious fanaticism, the influence on Zero, his presence in Heaven? What was being presented by way of message through this character? 16. Daisy and her suicide? The truth of their love? Zeros restraint and the reasons for this? An atmosphere of free love but puritanical restraint? The comparison of the earthly Daisy and the Heavenly Daisy? 17. Heaven turning into a work place, the adding machines, the long years that Zero spent there? Was he satisfied? 18. The character of the lieutenant and his role in Heaven? His telling of the truth and its effect? The irony of Zero's reincarnation? 19. How much glimmer of hope was there at the end? Daisy beckoning on the seashore? Would Zero ever attain this? Was it a vain hope but want to sustain him? 20. The 20th century themes of individuals and society, work, the meaning of life and death?